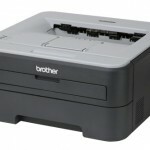 We have a Brother HL-2140 laser printer that we bought on sale to replace an older ink jet printer. So far, it’s been great. 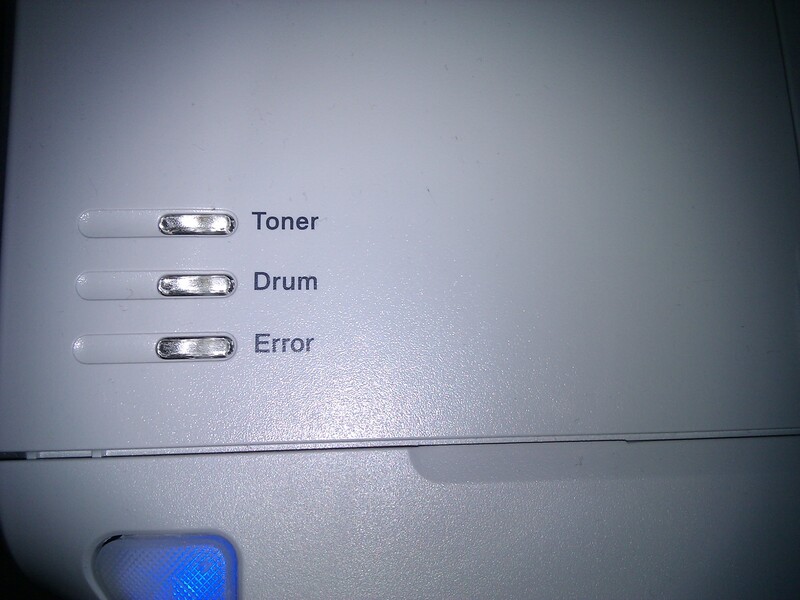 The only issue we’ve had is that the software used to determine when you need to replace the toner is either intentionally or unintentionally _very_ wrong. The reason we got the laser printer was because we were constantly having to refill the ink cartridge on the ink jet printer. So far, we have yet to finish using a single toner cartridge on the new printer (despite what the software would have you believe). An easy way to tell when you are out of toner is that the printouts will start to look faded. This wasn’t the case the first time the software told us we were out of toner. An unfortunate “feature” of this software is that if it thinks you are low on toner, you have no choice but to replace the toner before it will let you print. Therefore, we had to “trick” the printer into thinking that the toner was fine (which it was). The first step in doing this was to grab a post-it note and a piece of tape. Fold the post-it note into a tiny square and situate it over the opening in the toner cartridge. 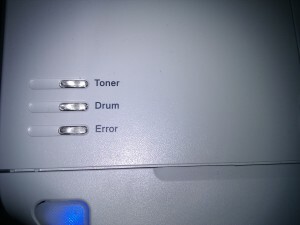 This is what the printer uses to check the toner level. 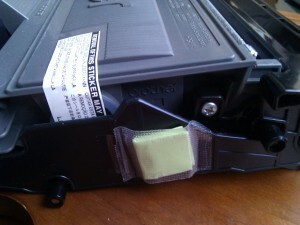 Cover the sensor with a post-it note and some tape. I had previously simply covered the opening with a piece of tape and colored it black with a sharpie. While that lasted a while, the software soon went back to thinking that the toner cartridge was empty and prevented me from printing. Next, you need to insert the toner cartridge back into the printer, being careful to make sure that the post-it + tape stay in place. Make sure that the post-it note and tape stay in place. 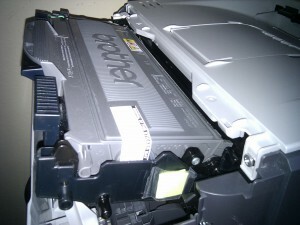 Once inserted back into the printer, you should be able to turn it on and notice that the Toner light is no longer lit. The software will then let you print regardless of how much toner is left. Rather than using a folder post it note, I used two layers of opaque black electrical tape. It worked like a charm and stuck tightly. The copies look perfectly good as there was still toner remaining. Cool! I didn’t have any of that available and had a few failed attempts at blacking out regular scotch tape. Really anything that you can get to fit which blocks the light should work. 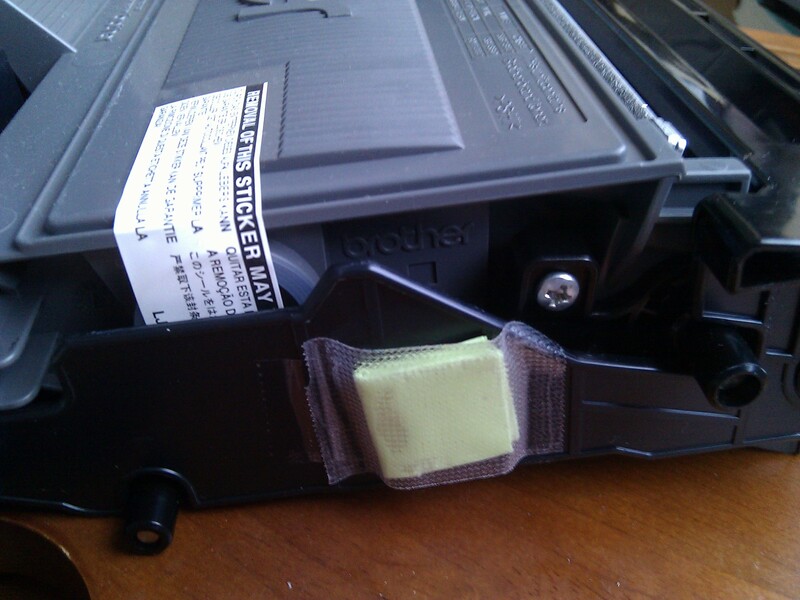 I took the toner out, then used black gaffer tape on both sides of rh hole. Thanks for great post n pix, i’m bak in business for no cost! Just worked for me. Thanks! It works! Awesome! Why would we waste toner while there’s still inks left? ! @#$% these printer companies.